Ferndale, MI- Weekends are fun at Dino’s Lounge, 22740 Woodward, Ferndale. There is brunch along with a mimosa bar. Dino’s is a sponsor of both Oakland County Times and Ferndale Pride. 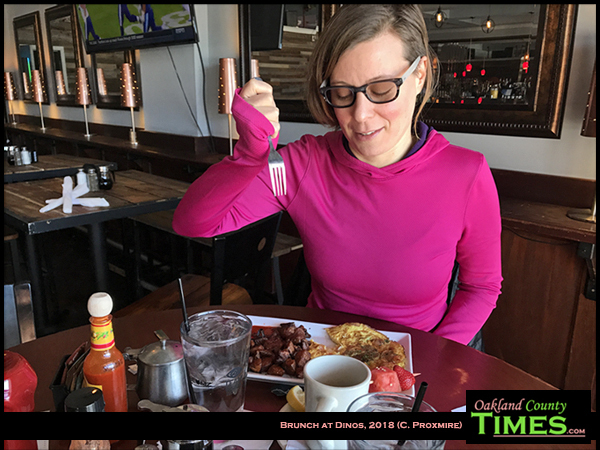 I had brunch there with the organizer of Ferndale Pride, Julia Music, to talk about the big annual event which is happening June 2. Some good things are in progress for the festival, but none that can go to press yet. While we didn’t have the mimosas, I did have a soothing hot toddy made with Numi Golden Chi Tea and Jack Daniels. Julia had the vegetable frittata and the house potatoes, which are diced and cooked with seasoning and onion. I prefer the shredded hash browns, which Dino’s always makes crispy and delicious. And I had the Farmer Papadopoulus Frittata, which is made with ground lamb, roasted red pepper, spinach, smoked Gouda and hollandaise. This combination was absolutely superb, and it will be my go to order from now on. Dino’s Lounge is a longtime sponsor of Oakland County Times, so I get to eat there a lot and I love it. Other frittata options include veggie, meat lovers, bacon buffalo chicken, Mexi farmer, and Palsano pizza skillet. Julia liked the meal too. 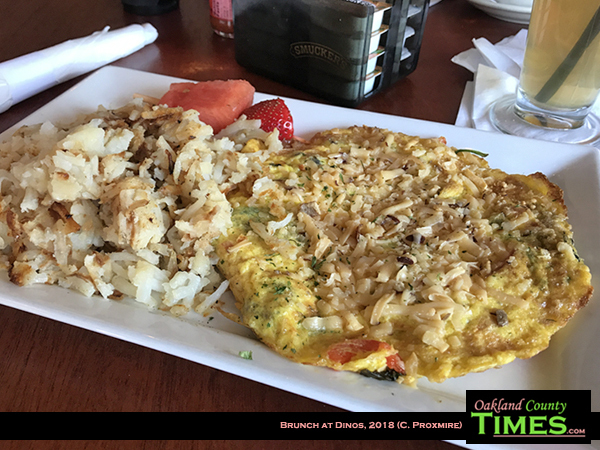 “We are fortunate to have Dino’s as a longtime supporter of Ferndale Pride. Aside from being a great friend to our community, I often bring my computer work for pride here. Their home fry style potatoes are perfect and their tea selection makes it a bar I can enjoy a drink in, when I can’t drink,” she said. Dino’s serves brunch on the weekends. During the week there’s a variety of items for lunch and dinner. Visit them at 22740 Woodward or online at www.Dinoslounge.com.